As regular readers know, I’m no fan of the current healthcare system in the United States, including the changes introduced by the Affordable Care Act aka Obamacare. But the Republican plan to replace Obamacare will make things even worse. Thus, the biggest losers under the change would be older Americans with low incomes, especially those who live in high-cost areas. They are the people who benefited most from Obamacare. For some people, the new tax credit system will be more generous. 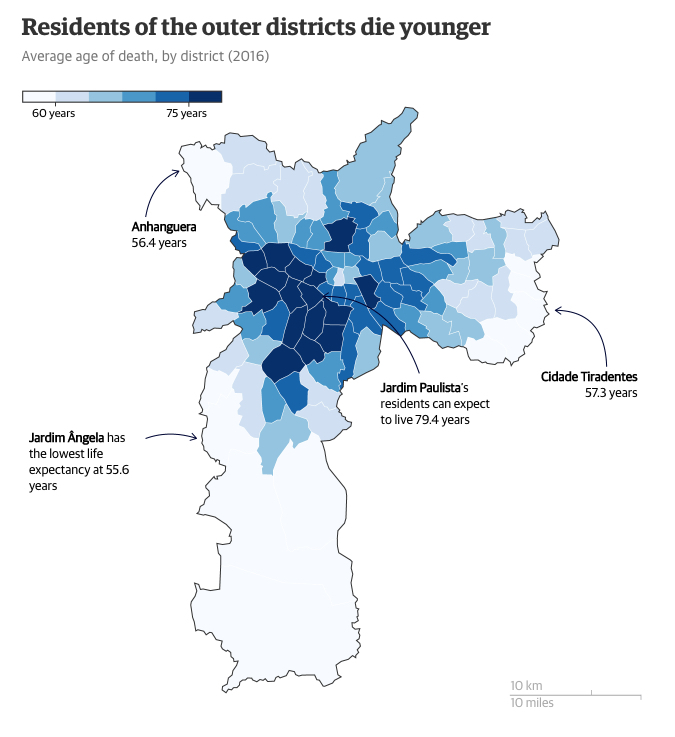 The winners are likely to be younger, earn higher incomes and live in areas where the cost of health insurance is low. And, of course, as the Wall Street Journal explains, top income earners would pay less tax under the replacement proposal. There’s simply no hiding the unequalizing effects of the Republican healthcare plan. 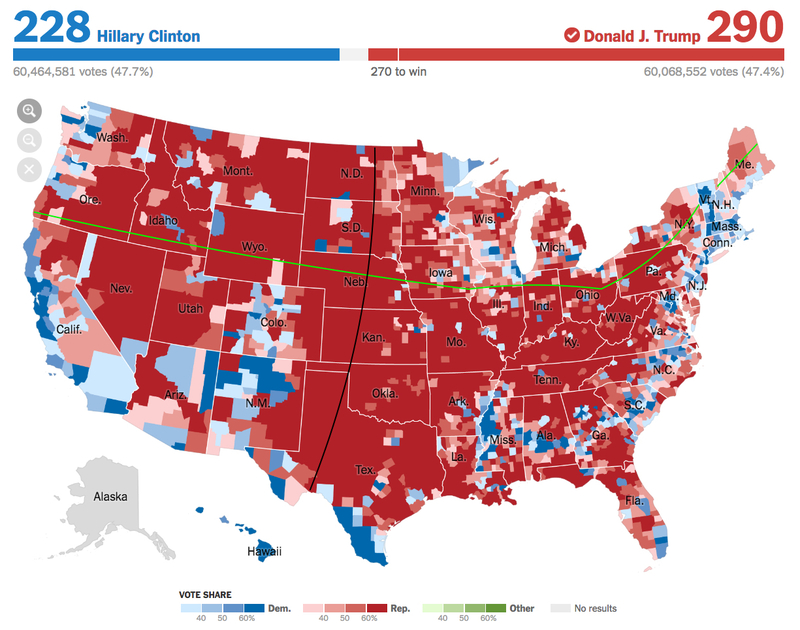 It is now (almost) possible to walk across the continental United States—East to West, from Maine to Oregon (or California or Washington)—and only step foot in counties that a Republican won in the presidential election (as in the green line in the map above). The only remaining gap is the solid-blue state of Vermont. Of course, it has long been possible to take a similar walk from North to South—from the Canadian to the Mexican border (the black line on the map). Between 1964 and 1973, during its “secret war” in Laos, the United States [ht: ja] dropped more than two million tons of bombs—the heaviest aerial bombardment in history. To this day, less than 1% of the bombs have been removed, according to US-based NGO Legacies of War, which is spearheading the campaign to clear them. “We were all but forgotten here,” says the Laos-born founder of Legacies of War, Channapha Khamvongsa. But the people of Laos can’t forget, as the “secret war” is still claiming victims. More than 20,000 people have been killed or maimed by the unexploded ordnance (UXOs) since the war ended, and currently, 50 people are maimed or killed every year. Around 40% of those are children. Farmers are also among the worst affected, as the poorest are forced to toil the mine-laden fields to feed their families. is the equivalent to a planeload of bombs being unloaded every eight minutes, 24 hours a day, for nine years—nearly seven bombs for every man, woman and child living in Laos. It is more than all the bombs dropped on Europe throughout World War II, leaving Laos, a country approximately the size of Utah, with the unfortunate distinction of being the most heavily bombed country in history. According to a new study, The Geography of the Global Super-Rich, by Richard Florida, Charlotta Mellander, and Isabel Ritchie, the United States is home to the world’s largest number of billionaires, with 541, 30 percent of the total. China is second with 223 or 12 percent. Next in line are India and Russia, with 82 billionaires (4.5 percent) each. Germany is fifth with 78 billionaires (4.3 percent). The United Kingdom is sixth with 71 (3.9 percent). 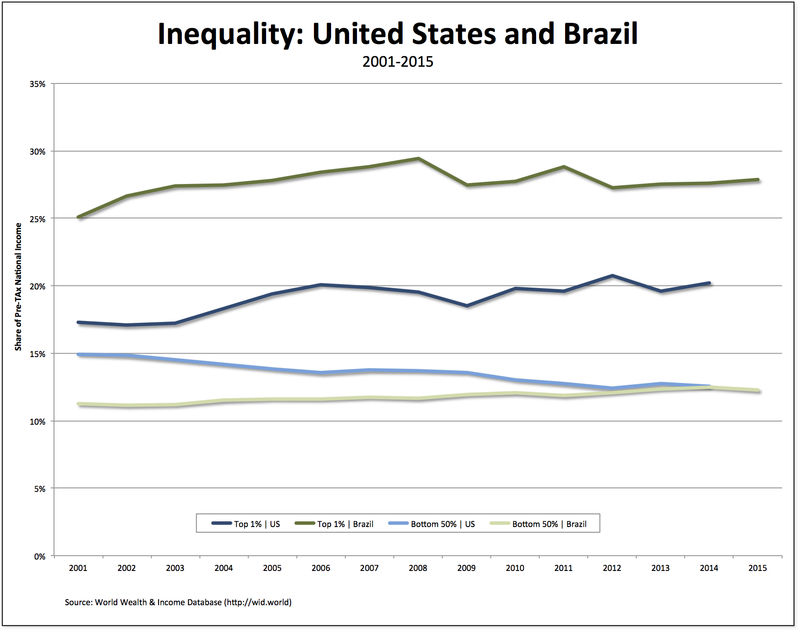 Switzerland has 58 (4.3 percent), Brazil 50 (2.7 percent), France 39 (2.1 percent), and Italy 35 (1.9 percent). Just to put things in perspective, the world’s 1,826 billionaires make up just 0.00003 percent of the global population. In no state, metropolitan area or county in the United States can a full-time worker earning the prevailing minimum wage afford a modest two-bedroom apartment. In order to afford a modest two-bedroom apartment at fair-market rent, a full-time worker in America today must earn $20.30 per hour—a figure that is almost $5 more than the average hourly wage of renters in the United States. A full-time worker needs to earn $16.35 per hour to afford a modest one-bedroom apartment. In Illinois (where the minimum wage is $8.25 an hour or $429 a month, and the average renter wage is $15.25 an hour or $793 a month), the fair-market rent for a two-bedroom apartment, at $1,039 a month, is out of the reach of both minimum-wage workers and workers earning the average wage for renters. Finally, consider this: a worker earning the federal minimum wage of $7.25 per hour would need to work 2.8 full-time jobs, or approximately 112 hours per week for all 52 weeks of the year, in order to afford a two-bedroom apartment at HUD’s Fair Market Rent. If this worker slept eight hours a night, they would have no remaining time during the week for anything other than working and sleeping.